Just more proof that this is a housing deficit recession. Men work in cnostruction, women don't. Using Private Construction data, it looks like GDP from housing is about 2% less than it would normally be. This should continue into 2014. We need to work off the housing surplus. Now that both are in the same ballpark, it would be interesting to see the same chart using a single vertical scale, rather than using a separate vertical scale for each gender. Some trial lawyers like to argue that women earn less money, on average, than men; and that this should form the basis for lawsuits. Now that men are faring worse in the job market, the lawyer parasites are strangely silent. To reach 5% unemployment, the U.S. needs to create 20 million jobs within four years, based on job losses and population growth. And, according to Warren Buffett, the U.S. is still in a recession, since per capita GDP remains below the 2007 peak. "WASHINGTON (MarketWatch) -- The Institute for Supply Management's manufacturing gauge in July dropped 4.4 points to 50.9%, barely staying above the 50% no-change line and coming in below a MarketWatch-compiled economist poll of 54.3%. The new orders index fell into contractionary territory"
it's all in the deflator. 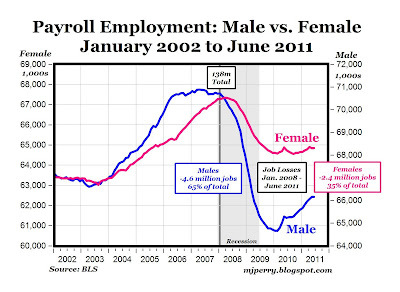 Keep in mind that there are indictions that men have retrained themselves to be able to pick different jobs. Feminists may howl, but having a regular, full-time job typically matters more to a man than to a woman. Read the Misandry Bubble for much more on how the government is forcibly transfering money from men to women. 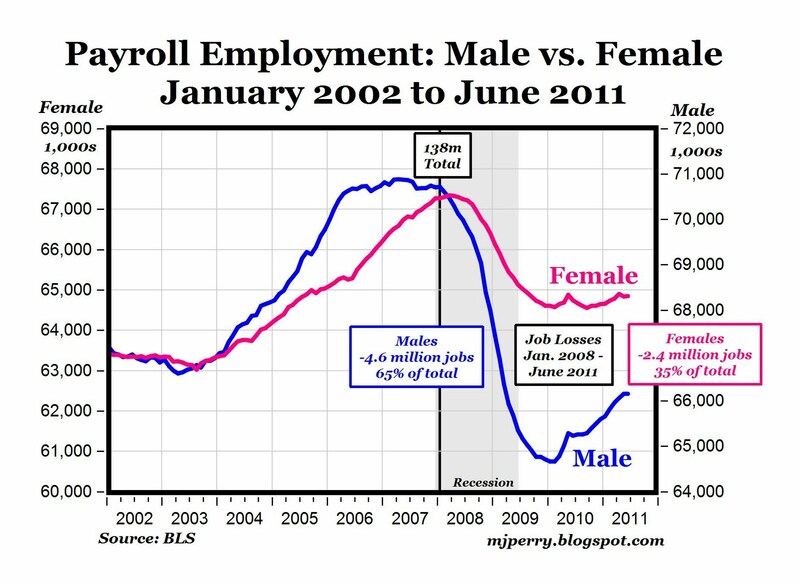 If destroying 2 male jobs creates 1 female job, the govt will do it. Those jobless men still have to pay alimony, you know, after his wife leaves him for being unemployed. Imagine the outrage if a man left his wife because she got fat, AND demanded alimony from her. But reverse the genders and the equivalent is fine in female-centric America.